Travel to Yellowstone and capture images of snowy Old Faithful geyser, ice-covered Bison alongside thermal pools, plus fox, coyotes, and perhaps wolves with professional wildlife photographer, Tom Murphy. Step carefully around delicate, chalky mineral terraces at Mammoth Hot Springs and discover multihued thermal pools and bubbling mud pots in the Geyser Basins. Witness small crystals and flakes form into “geyser rain” as Old Faithful erupts. Track elk, pronghorn, and red fox amidst a snowy and steamy landscape. Listen for the echoing howls of a pack of gray wolves haunting the stillness of Lamar Valley. Ring in the New Year in the heart of Yellowstone National Park and create your own photographic stories of a winter wonderland that will leave your audience speechless. • Learn about animal behavior and Yellowstone from local expert and photographer, Tom Murphy. 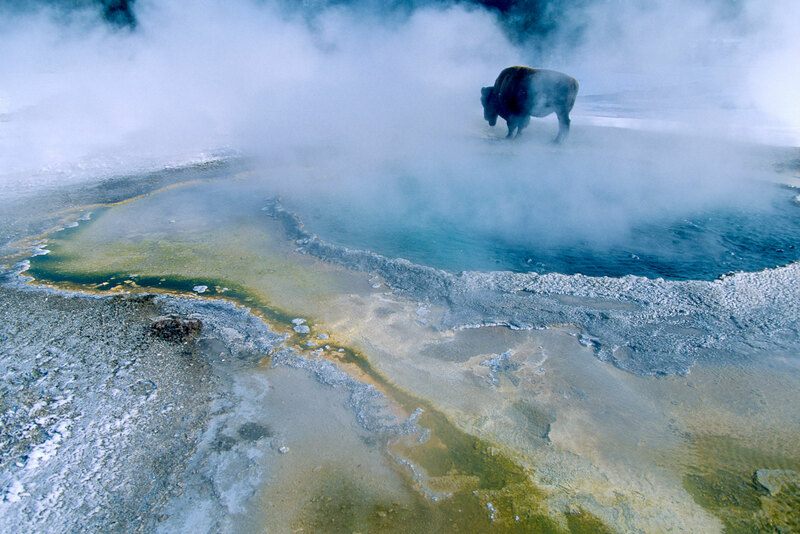 • Observe Yellowstone’s famous wildlife – bison, elk, gray wolf, and more. • Photograph spouting Old Faithful geyser and other fascinating geologic features. • Study photographic composition and technique in this hands-on photography workshop. Arrive in Bozeman, Montana for an overnight stay. Note: Specific destinations within the park are subject to change depending on weather conditions and wildlife. Meet Tom Murphy in Bozeman to embark on this special photographic journey. Drive south along the Yellowstone River into northern Yellowstone National Park. Discover the wild countryside where bighorn sheep, elk, pronghorn, bison, and coyotes roam. 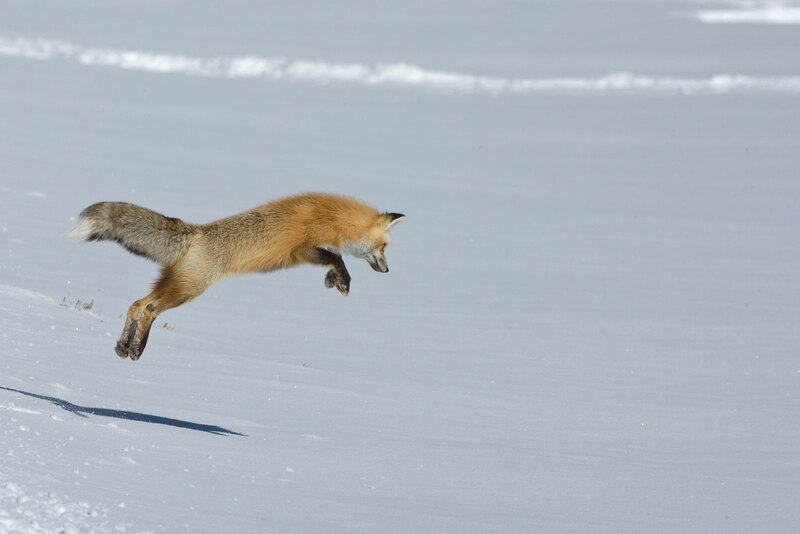 Use Tom’s familiarity of animal behavior to capture outstanding wildlife images. Take in the distinct smells and sounds of Mammoth Hot Springs where colorful mineral terraces are as spectacular as the wildlife. Explore the wildlife-rich Lamar Valley, the best place to see gray wolves as well as bison, elk, and a host of smaller mammals and birds. e National Park. 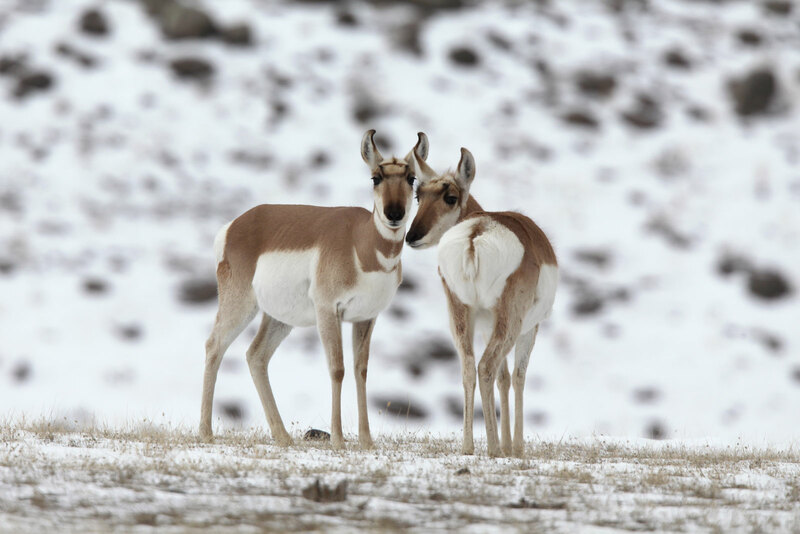 Discover the wild countryside where bighorn sheep, elk, pronghorn, bison, and coyotes roam. Use Tom's familiarity of animal behavior to capture outstanding wildlife images. Take in the distinct smells and sounds of Mammoth Hot Springs where colorful mineral terraces are as spectacular as the wildlife. Explore the wildlife-rich Lamar Valley, the best place to see gray wolves as well as bison, elk, and a host of smaller mammals and birds. Snow coach in Yellowstone National Park. Travel south from Mammoth Hot Springs to central Yellowstone, passing Yellowstone Lake and exploring beautiful Hayden Valley en route. Work on perfecting photographic technique while composing images of bison, pronghorn, elk, and other wildlife in different park habitats and pristine winter landscapes. End the day in the Old Faithful area before settling in at the historic Old Faithful Snow Lodge. Waiting for the geyser to erupt! Explore the Old Faithful area on foot by way of the extensive boardwalk system. Observe eruptions of Old Faithful geyser and discover other fascinating thermal features. The wildlife at the heart of Yellowstone is magnificent, creating striking photo opportunities amidst the contrasting backdrop of steaming pools and snow-blanketed terrain. Search for ideal winter scenes and wildlife to observe and photograph, and delight in bubbling mud pots, smoky fumaroles, and thermal pools of rainbow hues. Capture early-evening images of geysers illuminated by the setting sun, weather permitting. 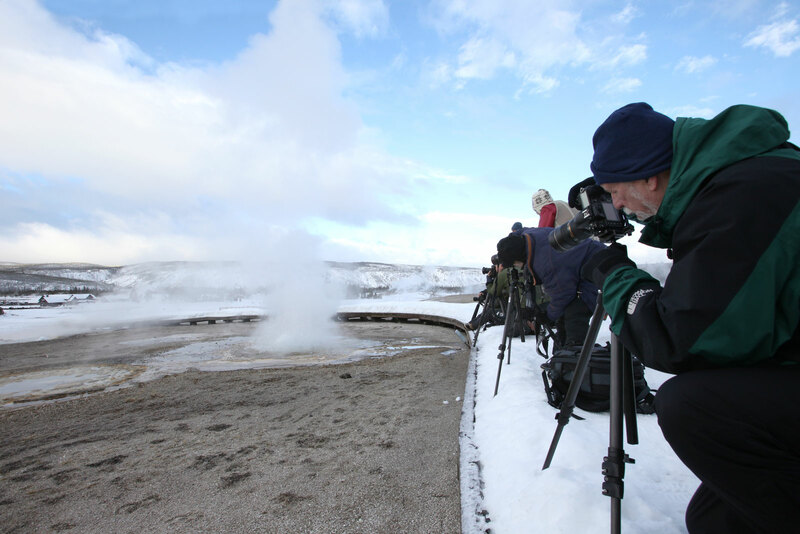 Return to Mammoth by private snowcoach, stopping to explore the Upper and Lower Geyser Basin and to photograph wildlife and the intriguing topography of Yellowstone. Return to Lamar Valley for more wildlife viewing. In addition to wolves and larger mammals, search for coyote, red fox, river otter, bald eagle, as well as trumpeter swan, bufflehead, and other waterfowl. Visit Tom’s hometown of Livingston for dinner together before returning to Bozeman. Travel to Yellowstone and capture images of snowy Old Faithful geyser, ice-covered Bison, fox, coyotes, and perhaps wolves. Payments are due based on the schedule above. All reservations require a deposit to confirm reservation of your space. For reservations made after a due date, all past payments will be due with registration. By sending your initial deposit, you agree to accept our payment schedule and cancellation policy as a contract. If payments are still outstanding two weeks after the due date, your space may be forfeited. Until the Final Payment due date, deposits are refundable except for a cancellation fee of $150 per person, which can be applied toward another tour if reserved within six months of the cancelled trip's departure date. Cancellations are non-transferrable. No refunds are given after the Final Payment due date. 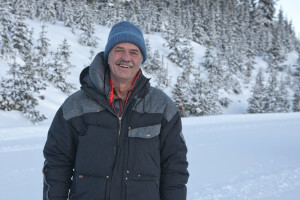 Privately chartered snowcoach in Yellowstone National Park on December 31 and January 3. Accommodations for the nights of December 28 through January 4. Meals from breakfast on December 29 through breakfast on January 5. Gratuities for bus and snowcoach drivers, and meal service. Gratuities to porters at Mammoth Hot Springs Hotel and Old Faithful Snow Lodge in Yellowstone National Park. All airfare, airport and departure taxes, and excess baggage fees. Airport transfers – free shuttle available to and from Bozeman hotel, but subject to hours of operation. Extra nights – we can arrange extra hotel nights for an additional cost. Gratuities to luggage porters at hotels outside the park. Daytime temperatures are usually around 0°F (-20°C) but may reach up to the 20’s°F (-5°C). Subzero overnight temperatures are common. Warm winds will occasionally push daytime temperatures into the 40’s°F (5–10°C), causing significant melting of the snowpack at lower elevations, but cold snaps may drive temperatures much lower. Snow is a good possibility. You should be comfortable walking with and carrying your gear or standing for several hours at a time. The group usually covers distances under one mile at a slow pace and may occasionally walk short distances in snow. Flights you (or a travel agent) book: Arrive in Bozeman, Montana at Bozeman Yellowstone International Airport (BZN) by the night of December 28. Depart from Bozeman anytime on January 5. Travel in a private 15-passenger bus between Bozeman and Mammoth Hot Springs. 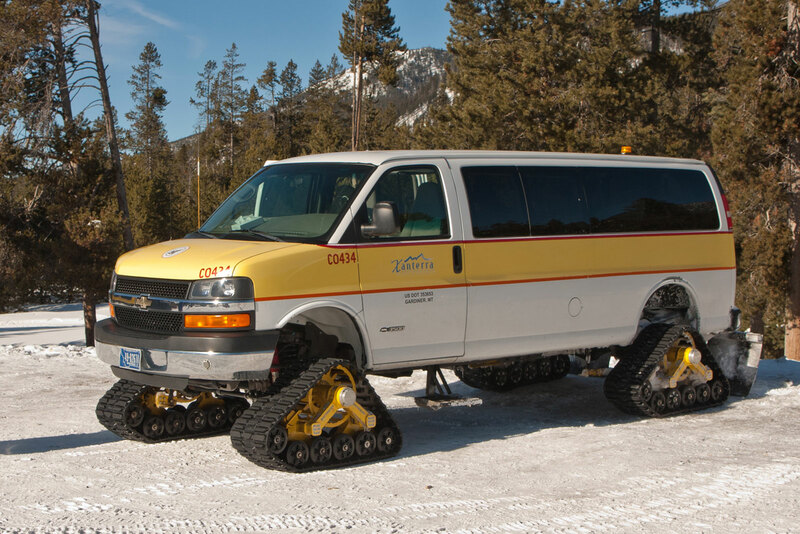 For maximum flexibility inside Yellowstone, you spend two days traveling by private snowcoach. "Tom was fantastic not only as a guide and knowledgeable resource for the park, but as a patient and encouraging photography teacher." "My favorite experiences were Trumpeter Swans putting on a big show for us on the Madison River and Moose dancing in the Lamar Valley."